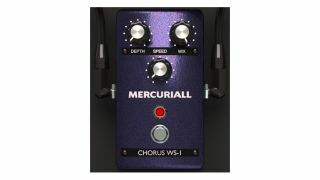 Guitar software tone hound Mercuriall Audio has released WS-1, a free stompbox-style chorus plugin. As you’d expect, the GUI is pretty simple, comprising just Depth, Speed, Mix, Mono/Stereo and On/Off controls. There’s not much more to say than that, other than that you can download WS-1 now for PC and Mac in VST/AU/AAX formats from the Mercurial Audio website.